NES fourth-grader Aliya Powers learns how to process honey. 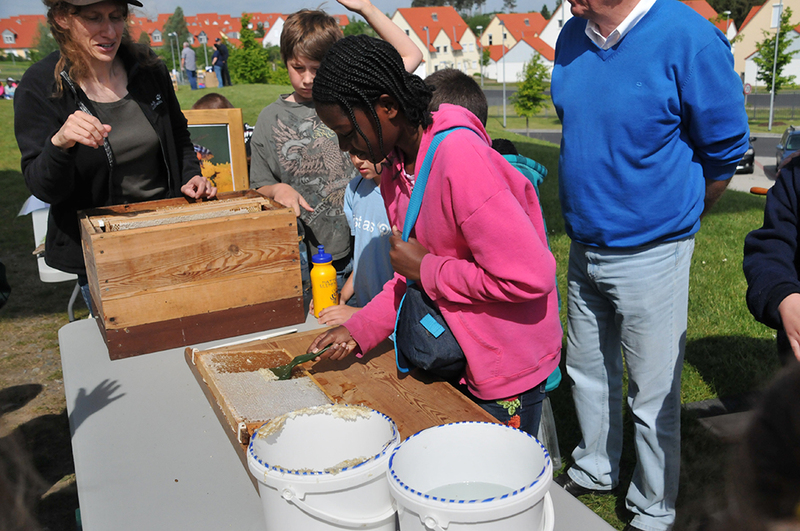 Netzaberg Elementary School partnered up with Grafenwoehr’s Directorate of Public Works Environmental Division to host the Earth Extravaganza and Volksmarch May 29. Photo by Priscilla Rey. GRAFENWOEHR, Germany — Let’s face it. Kids today don’t get out much. According to research published in the journal Nature, 88 percent of kids spend time online every day and 69 percent play video games or watch television every day. What’s more, kids ages 10-16 spend only 12.6 minutes a day in vigorous physical activity and average 10.4 waking hours relatively motionless, according to a study completed by the Seattle Children’s Research Institute. But teachers with Netzaberg Elementary School, with help from the environmental division here, are taking steps to change that. Netzaberg Elementary School partnered up with Grafenwoehr’s Directorate of Public Works Environmental Division to host the Earth Extravaganza and Volksmarch May 29. “I want students to realize the importance of the earth, nature and of being outside,” said event organizer and elementary school teacher Kimberly Martin. “Some of these kids don’t have the excitement of being outside like I had when I was a kid. I hope to give that to them when they leave. The day was divided into two parts. Kids and school faculty conducted a nature scavenger hunt along a Volksmarch through Netzaberg. Additionally, kids had opportunities to observe and participate in activities and stations set up by the school and the environmental division. Kids got up close to their natural surroundings. Kids spent the day outside learning hands-on about bees, leaves, nests and the food chain. According to the research in Nature, the main reason kids don’t spend more time outdoors is because it’s uncomfortable. Another major problem is that kids don’t live near natural areas. But in the heart of Bavaria, those excuses don’t fly. “I would love to see the kids outside everyday. There should be more opportunities for the teachers to teach outside,” Martin said. “We want to make the children see the environment from a different angle. Activities like this can be an eye opener to our children,” Rieck said.